Hatfield was once called Bishops Hatfield. And there has been a church dedicated to their patron saint, St Etheldreda, in Hatfield for over a thousand years. While in the grounds of Hatfield House a wing of a palace used by the Bishops still stands. Over the centuries many religious leaders have lived or visited Hatfield. These are a few of them. Given to the Abbotts, later Bishops, of Ely by King Edgar in the 10th Century, the town was called Bishops Hatfield (the diocese of St Albans was only created in 1877). Louis II de Luxembourg / Lewis of Luxembourg – Archbishop of Rouen, later forced to flee France, was created Bishop of Ely (1438-1443) after the Pope agreed to a request from Henry VI. According to Hatfield's first historian, following his death in Hatfield in 1443, his bowels were buried in St Etheldreda's, his body at Ely and his heart in Rouen. 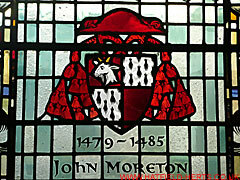 John Morton – Master of the Rolls, Bishop of Ely (1479-1486), Archbishop of Canterbury and later rose to the rank of Cardinal. During his tenure as Bishop of Ely he is credited with rebuilding the Old Palace and St Etheldreda's Church. The picture shows his coat of arms in what remains of the Bishop of Ely's London residence (please note the stained glass window maybe a modern installation as the spelling of his name and the length of his tenure are different to most sources). Thomas Goodrich (Goodryck) – Succeeded Bishop West as Bishop of Ely (1533-1554), and also served as Lord Chancellor. Credited with translating the Gospel of St John for the revised New Testament. A condition of his appointment was that he signed Hatfield and its Bishops Palace to the Crown (Henry VIII). William Cecil (1863-1936), brother of James Cecil, 4th Marquess of Salisbury, served as Rector of Hatfield from 1888-1916 before being appointed as Bishop of Exeter from 1916-1936. He was also chaplain to King Edward VII. He consecrated the memorial to Lt-Col John Stanhope Collings-Wells VC DSO, and the Officers, NCOs and men of the 4th Battalion of the Bedfordshire Regiment (Herts Militia) in St Etheldreda's Church, Hatfield, on 16 December 1920. It would have been a poignant moment for him as his the first of his sons to be killed served with this unit. A stained glass window memorial to his three (out of four) sons killed in action in WWI can also be found in this church. His surviving son was twice wounded in action. The Lord Archbishop of Canterbury, Reverend Honourable Geoffrey Francis Fisher (who crowned Queen Elizabeth II) – preached at the 400th Anniversary of the Accession to the Throne of Elizabeth I commemoration service at St Etheldreda’s Church in November 1958. Reverend R D Say, while Rector of Hatfield and honorary Canon of St Albans – nominated by Queen Elizabeth II to become Bishop of Rochester in 1960.